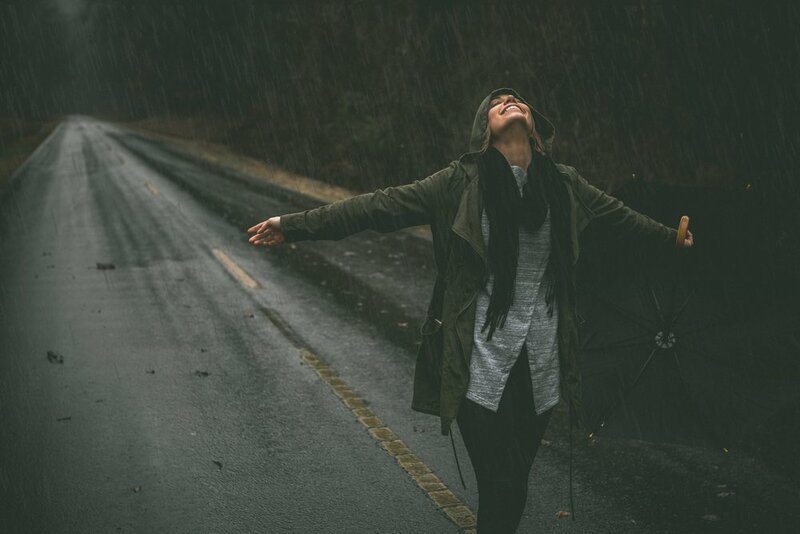 When it seems like everything is going wrong, will we choose to sit in the mess or worship in the rain? This week I am doing a study on the book of Job. It's been powerful, and more blogs will be coming soon on it, but I couldn't get past Chapter 1 without having to go live and share the beauty of this book. Today's post is an excerpt from the livestream, which you can catch at the bottom of this blog. I pray it impacts you. And here comes Satan and God goes, what are you doing bro? Like what, what is going on? Where have you been? He's like, you know, I'm just walking to and fro along the earth. Like as if he's just a little red riding hood. Like I'm just walking around. Right? And God offers like Satan isn't like, who can I have? Who can I test? He's just saying I was walking around and God says, have you seen, because he already knows Satan's heart. He already knows the disposition and that he's out to steal, kill and destroy. So God actually tell Satan, have you seen my servant Job? Have you checked him out? He is again, he is a righteous man. He's blameless before me. Have you seen Job check joe about? And here's what Satan says. And this stood out to me as well. Satan says, Job. Yeah, get that. But you have protected him. It's almost like you have a hedge of protection around him because you have blessed Job so much he doesn't have anything to trust you for. And that makes it sound robotic. This was something that really stood out for me because I've had people say, well, why did God allow Job to be tested? Or why does God allow for bad things to happen to good people? And in that part I feel like I see an answer to that because if, if God doesn't permit in our fallen world where we chose sin, right and sin has entered, if God does not permit there to be temptations and trials that go against us, there is no opportunity for us to exercise free will to say no. I'm still choosing Jesus. Even if there are things that are going wrong, even if there are things that are hard, I'm still choosing Jesus. So God says, no, you can go and test Job. That's cool. Hey Joyce, how are you? So God says, no, you can go and touch Joe. Don't lay a finger on him, but you can go test them. Whatever you want to do to his circumstances. This hedge of protection that you're saying that he has, whatever it is, you can literally go and test them, but don't you touch my servant, but go and test him because God knows that even in Joe being tested right, that he's still going to choose God and this is not robotic. Like jove is not a robot that he has to choose God. This is his free will. This is Job, loves God and Job chooses God. That his free will. That's beautiful y'all. So, so of course we know Satan goes in the first strike, he goes in and he kills his kids and he takes out like his animals, his, you know, how he made money, his, you know, he takes out business basically from him and Job's response. Job's response is worship. He still says God, you're good. Like I trust you in this. And that's where the, the popular saying the Lord Giveth and the Lord Taketh away. That's where that comes from. Job Says, God, you give and you can take it. So, so like, I'm not going to trip. I'm thankful my children are gone. Get this like this is deep, my children are gone, but I thank you for the years that I had with them. My cattle are gone, but I thank you for the provision that you gave me through them. I'm not going to say, God, why did you take this away? You are God and I'm going to trust you. I'm going to trust you, but I'm going to worship you for the good and the time that I had then if we go into, into Job too, and we kind of keep studying. Yes, Kenesha. Amen. Amen. Amen. Amen. Um, when, when we continue studying into Job too, and that's where I'm going to stop. This is going to be kind of quick, but when we go into Job too, and then basically we're back up in heaven, right? God is there, the angels are there. Satan comes back in. God's like, what you're doing abroad. Once again, saying the same thing. Oh, I was walking to and fro across the earth. Just checking it out. Once again, have you seen my servant Job? And he says, well, yeah, but you know, again, like you're protecting him. Like he's basically kind of pushing God like, like you're not allowing me to really do anything of substance to him, for him to show that he really loves you, like, like you're protecting him. So how do you know that he loves you? And so God this time says, okay, you can touch him, but don't you take his life. And that's when he, he gets sores. Satan put sores all over his body. Literally it says that he was breaking clay pots to scratch himself. Think of that like if you went into your kitchen and you broke a dish, right? Something or, or something that's clay to scratch it off of your body because you're that like it's itching that much. It's all over you. You can't get rid of it. And even then Job's wife says like, you fool, why don't you just curse God and get it over with and die? Because if you curse God and you say, God, why have you done this? And you shake your fist up at him, then God will just smite you. That's their thinking. Like just curse God. Let him smite you and die. You're miserable. You're kids are gone. You've lost the business. Now your body is a hot mess. I don't want to lay up next to you. I don't want you in my bed. I have nothing left. Just curse him. Let it be over with, and Job's still says you. Foolish woman that like God gives. And then and then he also says, but should we only rejoice in God when he gives or also in trouble also when we're tested, right? And that goes back into what my pastor was preaching on Sunday, that even when we are testing it says in James One, I think James went, Ooh, James went to James. Three, two, seven. I forget, sorry, but somewhere in the beginning of James it says, I believe it's James James, sorry, James Three at the beginning is about taming your tongue. I believe it's James One, but where it says, you know, counted all joy when you're going through trials, when you're, when you're, when you're having to persevere because that builds up character and so this is what we see in Job and of course it continues on. After that, his three homeboys show up and they're steering him wrong theologically and Job's like, Nah, bro. Like that's not even what it is. Despite what they're thinking, they're thinking, well, you must have seen. You must have done something wrong. He's like, no, you don't even know the situation like that. I haven't seen. I haven't done anything wrong and we know Job would be analyzing this. I mean he gave sacrifices for his kids, but his kids didn't even do anything wrong. Just to be safe. Job was cautious. Job was really prostrate before the Lord like God. If I've done anything like search me, if I've done anything, let me know because I will. I will go and make an offering. Okay, but here's the thing. God gives opportunity for us to be tortured, for us to go through bad seasons, for us to have rough days because it gives us a choice. We have free will, right? If we didn't have freewill, Adam and eve would have never seen in the first we would be robots, but we have free will and free will is an opportunity for us as Christians, as believers in Jesus to say no matter what's going on around me, no matter what my circumstances are, that I still choose joy, I still choose Jesus. I still choose to follow him. I'm not going to talk bad about God. Why have you allowed this to happen? And it's not saying that there's anything wrong. If you do that right, like it's okay sometimes be like, man, God, what is going on? Like why would you? Everything was good. Like we were good, we were good. It's okay to question and that's what Job does. In fact, we're going to. I'm going to skip to the end and give you kind of the cliff notes. At the end of the book of Job, God says that Job is so righteous and Job was right and that's because throughout Job was questioning that Job was saying, God, he did get to a point because of the negative influences around him. Ooh, wait a minute now because that's a whole other sermon, but when you let the negative influences around you, the people who say that their brothers and sisters in Christ, but they really listening to God and they're giving you will, you must have done something wrong and they're telling you something of their flesh. That sounds good. That's logical, but it's not of the spirit. You better watch that because that's what his three friends were doing that were surrounding him. They were coming around with their logic, their thoughts, and it wasn't even correct. It wasn't even the right posture. I'm getting a text. Let me clear that out. Sorry. But this is the point. So, so Job question God. And then God came back like, listened Job. Let me tell you something a little sir, were you there when I created everything? Were you there when I told the sea where to stop? Where you there? When I told the sun were to sit in the stars and the moon were to say, were you there? What? I did all that. No. Okay. So you don't know because it goes back to, uh, what is it, Jeremiah? My ways are higher than your ways. My thoughts are higher than your thoughts, like we don't know God and we don't know what his purpose is, but what I can tell you is Romans eight, 28, all things work together and if God is allowing anything negative to happen in your life right now, I want you to encourage you that it is for your good. I want to encourage you it as an opportunity for you to choose joy, for you to say, God, I don't know what's going on. I don't know, but I know that you're good. I know that you're a faithful. I know that you love me and I know that you're not going to let this take me out. I know that you're not going to let this take me out. So I'm going to choose joy and I'm going to choose to worship you and honor you in this situation. You're going to turn on that worship music and you're going to blast it and you're going to lift your hands up. Okay? And you are going to praise him. That's what you need to be doing. That's what I need to be doing. When, when, when, when things are going hard or wrong, or what we perceive as wrong, right? We need to choose worship. We need to choose to abide in his presence and say, God, I don't know what's going on and I don't need to pray. Why? And you don't need to even give me an answer. God, I don't need an answer because I can't even fathom everything that you know. I don't need an answer. All I need to know is that you are my father and you are with me and you're standing in the storm with me. When the storm was raging in the new testament with Jesus, when the storm was going off and end, the disciples are like, no, no, no. Like, what's going on? Hold up. Jesus. Come stop it. Right? And he did. He did call them the wind. He, he, he shot it down. But he said, why are you like basically, why are you tripping right now? I'm here. I'm with you. I'm with you. I'll never leave you. I'm here. Do you think I'm going to let this storm take you out? Do we think Jesus physically been there? Was going to let the storm take him out now he had to get to that across the storm, was not going to take him out. We need to rest and say, God, I trust you and I follow you. That's it, and the way that we do that again is through worship because when we don't feel like it, but you turn on that worship music baby and you start worshiping him. I'm telling you, it shifts the atmosphere. It shifts your posture. It shifts your mood. I'm telling you, if you were going through it or when you go through it, because we all go through it. We all go through it to different levels. We all go through it, so the next time you're going through it, I want to tell you, turn on that. Worship Music. Don't you call friends on the phone who don't know? Call wise counsel, who will pray? But the second, let me tell you something, because there have been times where I've talked to friends about things and they started telling me something and I'm like, oh wait, no. They mean, well they mean well, but no. And I got to shut it down like, yeah, okay. Well thank you. Thank you. That was good advice. Thank you. And I just walked out and got the time to explain it to them, but I know who I can't receive that. That's not it. And that is usually a reminder of Michael. You're going to people before you're going to the throne. You need to go get on your knees before God turned on your worship music. You don't need to call your friends right now. You don't need to call everybody. You need to get before Jesus because he'll answer you. He'll answer you. So I'm gonna. Stop. I'm gonna. Stop. I'm gonna. Stop. But listen, listen, listen. Turn on your worship music tonight. I want you to turn on some worship music. I want you to listen to at least one or two songs tonight. If you're listening to this, I don't care if you feel like you're going through it or not. Even if you feel like you're good, just go worship him. Okay, go worship. I'm going to turn on my worship music after this. I want you to turn on your worship music and let's worship Jesus tonight. I love you guys. God bless you and I pray for you guys in Jesus' name, amen.